What if doctors could use a patient’s own stem cells to develop new skin to help treat their burns? How would this transform the way patients, particularly those with the most severe burns, recover? These are the questions Dr. Marc Jeschke at Toronto’s Sunnybrook Research Institute is trying to answer. His work will lead to the world’s first clinical trials to test this type of therapy on burn victims. If it’s successful, this stem cell treatment could be the key to faster healing and improved scarring – a huge leap forward in patient care which also has the potential to reduce the extensive costs associated with long hospital stays and infection treatment. 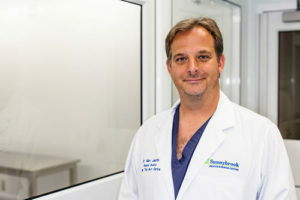 Jeschke, who trained in Germany before taking on a position in Texas, is one of the world’s leading experts in burn treatment. He started his career working in pediatric burn units and was recruited to Ontario eight years ago for the opportunity to lead Sunnybrook’s Ross Tilley Burn Centre as Director, which allows him to conduct the type of translational research he does best. “It was the collaborative spirit of the Sunnybrook Research Institute and the University of Toronto, the quality of science, the quality of the department, the quality of all the departments at U of T,” he explains. He was also drawn to the chance to build a translational research program and conduct stem cell research; making Sunnybrook an attractive choice for Jeschke, though he admits that caring for children is something he misses. One of the major draws of Jeschke’s project is that it uses a patient’s own stem cells to develop new skin cells. This is a major difference from other trials that have used cells from a donor source, known as allogeneic cells, to try and develop skin. This often leads to rejection, which is what Jeschke’s process hopes to avoid. “There shouldn’t be any [rejection], because basically it’s your own cells. And the phenomenon of rejection is only when you have different humans and different species, like a pig to a human, there you have the rejection phenomenon, but your own cells under normal circumstances, should not cause rejection,” he says. Because these patients are also fighting off infection from the burn itself it is not possible to have patients take immune suppressants in combination with the cell treatment, as is done with other allogeneic cell therapies. His work has thus far received strong backing from not only the more traditional NIH and CIHR grants, but also from outside donations from companies where burns are a major risk factor for their employees. A treatment like Jeschke’s could have major implications in the health outcomes of their team members, allowing staff to return to work sooner and reducing the length of time employees are supported by long-term disability, ultimately improving their quality of life. Support from these non-traditional sources has helped to leverage the investment from OIRM, getting Jeschke one step closer to bring this therapy to patients. Follow our updates on social media and in our newsroom to see Jeschke’s progress.